Barber recently helped organize the Poor People's Campaign: A National Call for Moral Revival. Standing on the shoulders of the Poor People's Campaign organized by Martin Luther King Jr. in 1968, the program involved 40 days of direct action for racial, economic, gender, and environmental justice in 2018. Economic inequality in the United States has reached record levels. The actions of the federal government and local police officials have laid bare the legacy of racial terror and family separation that the country was built on. The Reverend Barber's movement addresses the root causes of these interrelated issues. Barber is the author of The Third Reconstruction: Moral Mondays, Fusion Politics, and the Rise of a New Justice Movement (2016) and two other books. He also founded the organization Repairers of the Breach. His guiding principle is that "fusion coalitions rooted in moral dissent have power to transform our world from the grassroots up." 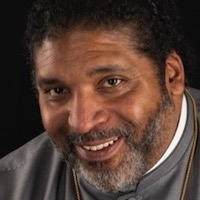 Cornel West says, "William Barber is the closest person we have to Martin Luther King Jr. in our midst."